Downtown West Yellowstone Montana, near the West Entrance to Yellowstone National Park. most popular tourist towns in the entire region. The West Entrance is the busiest entrance to Yellowstone Park, and the busy little town of West Yellowstone has everything a visitor needs with regard to shopping, tours, rentals, restaurants and lodging. Founded in 1908 when the Oregon Short Line Railroad was completed, West Yellowstone is without a doubt one of the main gateways to Yellowstone National Park, and is a blast to explore. 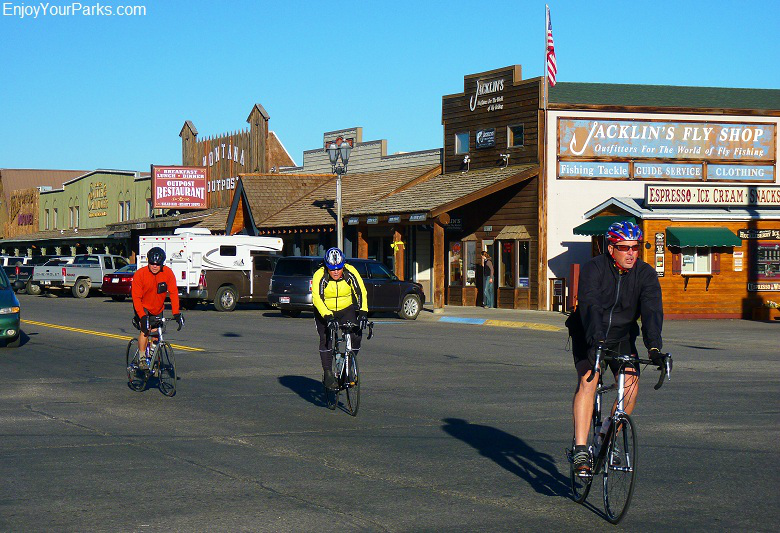 West Yellowstone Montana provides visitors with a host of hotels, motels, vacation rentals, restaurants, gift shops, fly fishing shops, fishing guides, tour guides, adventure guides, safari guides, snowmobile rentals and snow coach rentals. Some of the popular attractions in West Yellowstone include the Yellowstone Imax Theater, Grizzly & Wolf Discovery Center, Historic Madison Hotel, Yellowstone Historic Center Museum, and much more. There are also many other great things to do and see in this world famous Yellowstone National Park entrance town, and we highly recommend that you take some time to discover this wonderful iconic town. 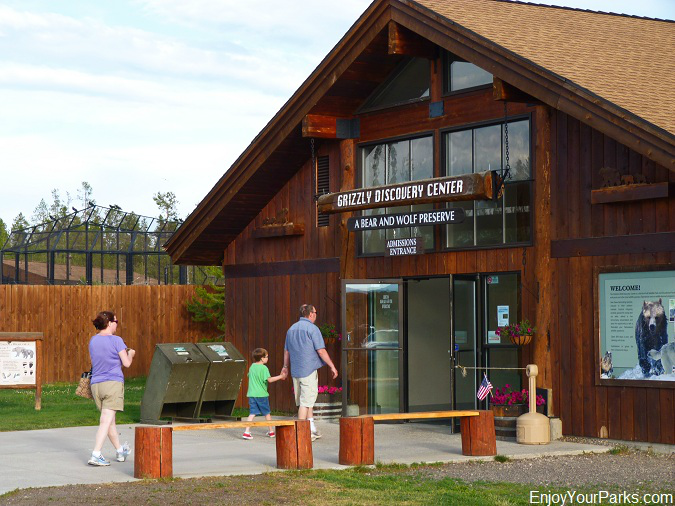 The Grizzly & Wolf Discovery Center is an extremely popular destination for visitors while they are exploring West Yellowstone Montana near Yellowstone National Park. Open 365 days a year, you and your family can watch grizzly bears and gray wolves in a wonderfully natural setting. This is a great opportunity to watch these beautiful animals "up close and personal" as they do their day to day activities. The grizzly bears at the Grizzly & Wolf Discovery Center were either orphaned and would not survive in the wild, or they are "problem bears" that otherwise would have be destroyed. The wolves were all born in captivity. And by the way, these particular grizzly bears do not hibernate, so you can see them "doing their thing" all year long! 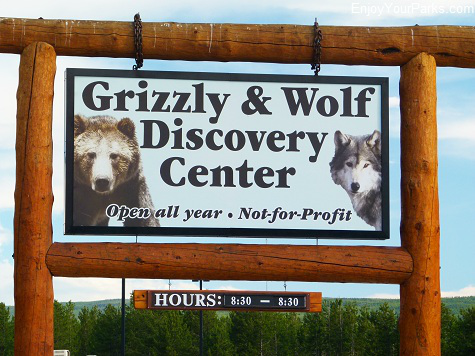 Grizzly & Wolf Discovery Center in West Yellowstone Montana. 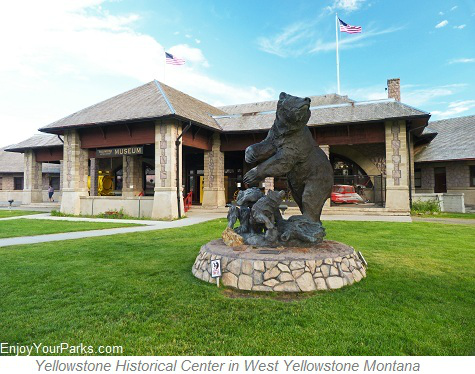 Accredited by the Association of Zoos and Aquariums, the Grizzly & Wolf Discovery Center is a tremendous asset to West Yellowstone Montana, and we highly recommend that you check it out while exploring this wonderful Yellowstone Park entrance town. 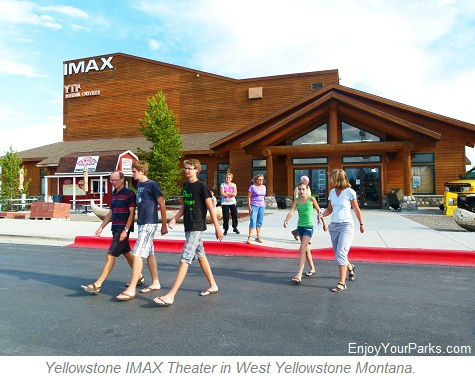 The Yellowstone IMAX Theater, located in West Yellowstone Montana near Yellowstone National Park, provides outstanding Imax productions that are all world-class productions. In addition to this ever-changing line-up, there is one production entitled "YELLOWSTONE" that was filmed in Yellowstone Park, and they run this movie several times a day. "Yellowstone" is a spectacular production that takes you on a journey begining 100,000 years ago, and takes you all the way up to the present time. You and your family will be completely enthralled the entire movie. The Yellowstone IMAX Theater also has a wonderful gift shop that you should definitely take advantage of while exploring this fantastic theater. 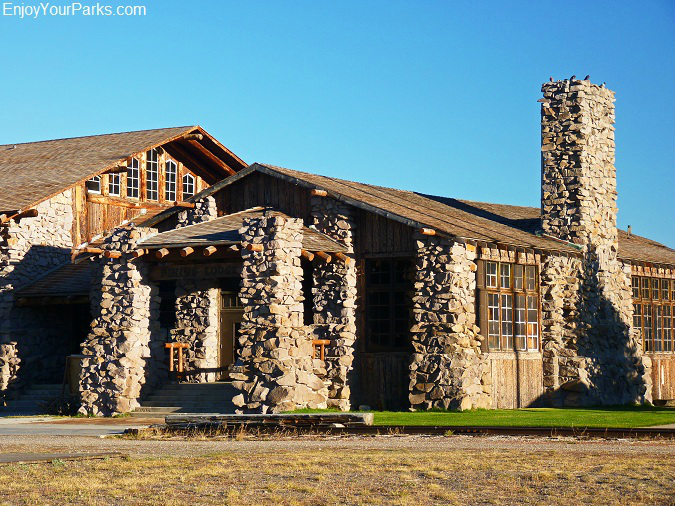 Also located in West Yellowstone Montana is the Yellowstone Historical Center. If you're interested in Yellowstone Park history, then you'll love the Yellowstone Historical Center! This amazing place includes not only a fascinating museum that's located in the historic Union Pacific Depot, but it also includes The Oregon Short Line Terminus Historic District. This fascinating 10 acre area next to the museum includes a historic dining lodge, baggage building, depot, pylon dormitories, industrial buildings and a water tower. This historic dining lodge was known as "The Beanery", and is located in the Oregon Short Line Terminus District of the Yellowstone Historical Center in West Yellowstone Montana. It was built in 1908, which is the same year West Yellowstone Montana was founded. Snowmobile Capitol of the World! 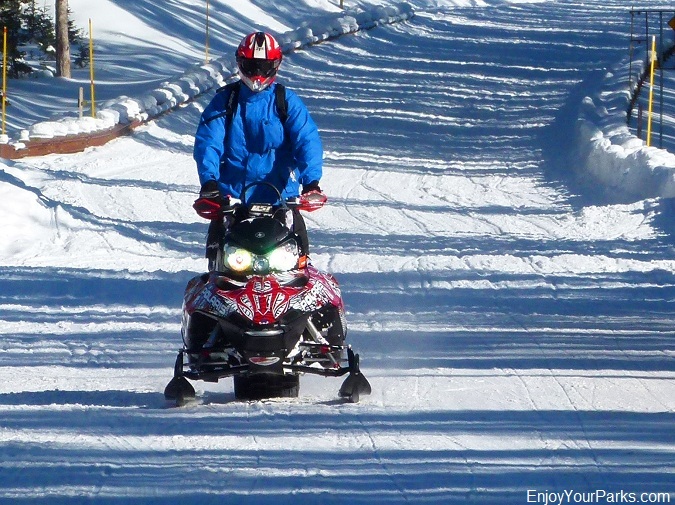 West Yellowstone Montana has some the best snowmobiling and extensive trail system on the planet, and that is why it's known as the "Snowmobile Capitol of the World!" This really is no exaggeration... the snow is amazing, and the trails seem to go forever! In fact, there are over a thousand miles of groomed trails, and endless off-trail powder just outside West Yellowstone Montana and are world-class experiences. Two Top Trail, Lionshead Trail, Horse Butte Trail, Big Sky Trail, South Plateau Trail and Continental Divide Trail are but a few of the iconic trails surrounding the West Yellowstone Montana Area. There are also 200 miles of groomed trails in Yellowstone National Park, however you are required to have a guide with you if you plan on snowmobiling in Yellowstone. 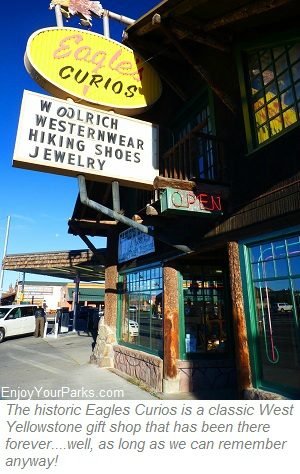 West Yellowstone has several guide companies to choose from. Popular Yellowstone Park routes are from West Yellowstone to Old Faithful via the Madison Canyon and Firehole River, Old Faithful to Fishing Bridge via West Thumb Geyser Basin and Yellowstone Lake, West Yellowstone to Norris Geyser Basin, Canyon Area and Mammoth Hot Springs. 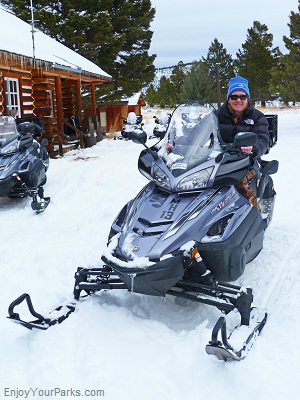 If you like to snowmobile, snowmobiling in the West Yellowstone Montana area is a "MUST DO". You will not believe how incredible the trails are and how amazing the snow is! 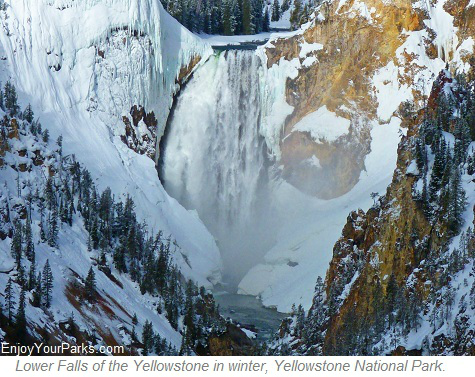 For more information on Winter in Yellowstone Park click here. West Yellowstone Montana is one of the main gateways for visitors vacationing in Yellowstone National Park during the winter season. 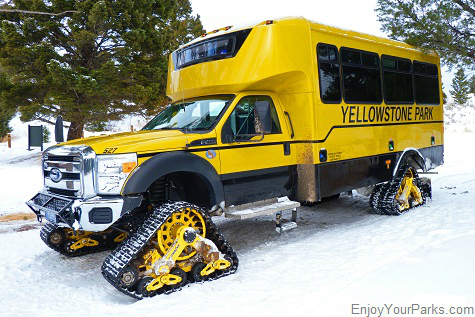 Winter in Yellowstone Park is an extremely beautiful and magical time, and many of the snow coaches and snowmobile tour guides are located in West Yellowstone Montana. The road leading into Yellowstone Park from the west entrance at West Yellowstone is closed to all wheeled vehicles throughout the entire winter season. Therefore, the only way into the park is by snow coach or snowmobile. And the most popular destination for visitors inside Yellowstone Park is the Old Faithful Area, where visitors can stay at the Old Faithful Snow Lodge. This makes the route between West Yellowstone Montana and Old Faithful the most used route in the park, and it is very scenic as you follow the Madison River and Firehole Rivers, as well as "Geyser Row" where many of the famous geyser basins are located such as the Lower Geyser Basin, Midway Geyser Basin, Biscuit Geyser Basin and Black Sand Geyser Basin. These geyser basins are home to some of the most famous geysers on earth, such as Grand Prismatic Spring. Of course once you get to Old Faithful, you can watch the grand-daddy of all geysers erupt, which is Old Faithful Geyser. There are also groomed routes leading to Fishing Bridge via West Thumb Geyser Basin and Yellowstone Lake, as well as Hayden Valley, Canyon Area, Norris Area and Mammoth Hot Springs Area. 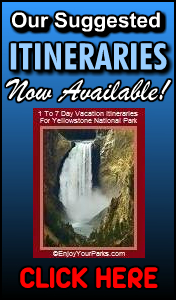 For more information on Winter in Yellowstone Park, click here. 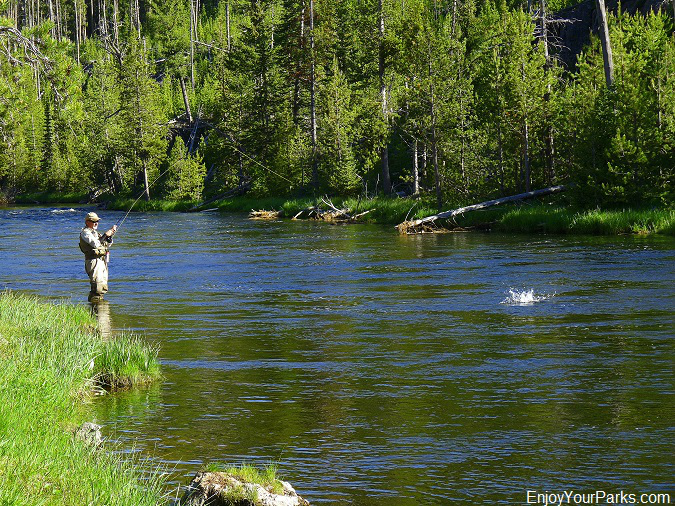 West Yellowstone Montana is also regarded by many to be one of the TOP TEN TROUT TOWNS in America with good reason...there are a ton of blue ribbon trout streams and world class lakes that surround West Yellowstone. Inside Yellowstone Park, there are over 200 rivers, streams and creeks that are fishable, as well as over 45 fishable lakes. Some of the most famous streams include the Madison River, Firehole River, Gallatin River, Gibbon River, Upper Yellowstone River, Lower Yellowstone River, Gardner River, Lamar River, Slough Creek, Soda Butte Creek, Lewis River, Snake River and Bechler River. Among the most popular fishable lakes in Yellowstone National Park include Yellowstone Lake, Shoshone Lake, Lewis Lake, Heart Lake, Trout Lake and Grebe Lake. 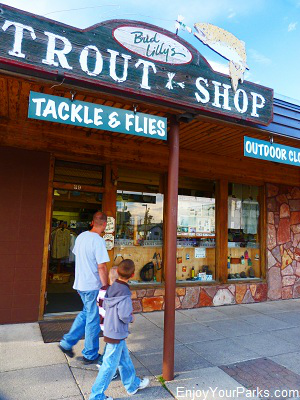 There are a handful of outstanding fly shops in West Yellowstone, such as the world famous Bud Lily's Trout Shop and Bob Jacklin's Fly Shop. 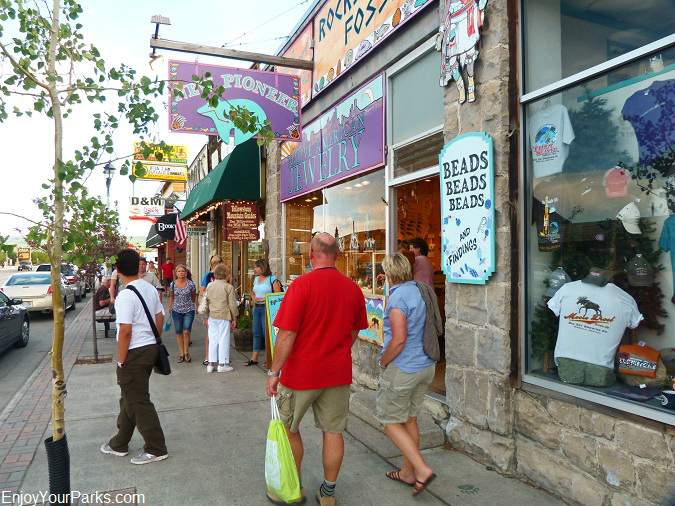 Even if you don't fish, it's always a treat to see these iconic "mom and pop" stores that have such as world wide reputation! If you love to fly fish, or if you'd like to try fly fishing for the first time, then West Yellowstone is the place to be. And by the way, you don't have to fly fish to enjoy fishing for trout in the Yellowstone Area. There are other fishing techniques that are very effective, and these shops will steer you in the right direction. The Firehole River is among the many popular rivers in Yellowstone National Park for fly fishing. Listed in the National Register of Historic Places, the Madison Hotel was built in 1912 and is an integral part of the fabric of West Yellowstone Montana. This charming log structure is a vintage western hotel that is cozy and inviting. As you stroll down the sidewalks of West Yellowstone, make sure to stop in and explore the historic Madison Hotel...It's really a treat. 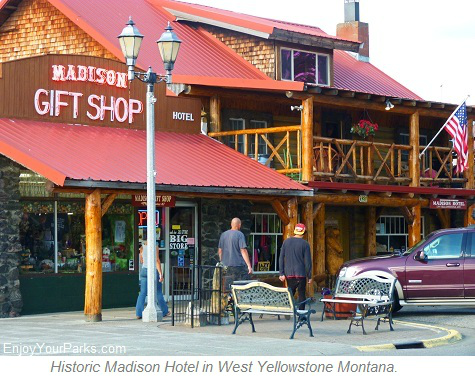 Aside from everything we've just mentioned, there is of course all the great gift shops, hotels, motels and restaurants located throughout West Yellowstone Montana that are there to make your stay in the Yellowstone Park area an extremely enjoyable one. 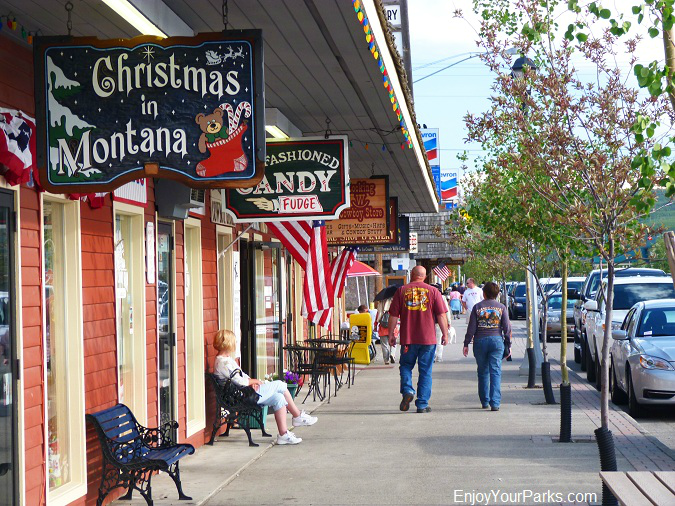 We love West Yellowstone Montana, and we are confident you will too! It's a charming little town that is as much of a part of Yellowstone National Park as Old Faithful Geyser, and the memories of all the times our family walked its sidewalks during our Yellowstone Park vacations are very much still with us, and will always be with us. Walking along the side walks of West Yellowstone Montana is a classic thing to do during your Yellowstone National Park vacation!